Family owned since 1940, 8th Street Music in Pennsauken, N.J., is a longstanding music store with a colorful history and a vibrant selection of the finest instruments. When founder Albert Hershman first opened shop, he had a small pawnshop, located on 8th and Market streets in downtown Philadelphia, that sold jewelry and a few musical items. Philadelphia was also home to hugely successful television show American Bandstand, bringing some of the most popular music acts to town. The city itself also spawned some of early rock’s best-known vocalists, including Chubby Checker, Frankie Avalon, James Darren and Bobby Rydell. This thriving ’50s and ’60s music scene would determine the fate of 8th Street Music, which began selling musical instruments exclusively in the 1960s and is now a music megastore. 8th Street Music called Philadelphia home for 27 years, but after outgrowing its location there it was moved to South New Jersey, with a warehouse and showroom to complement its website. Aside from being the first music store to do online sales in the mid-1990s, 8th Street Music was also one of the very first Guild dealers in the 1950s. Current owners Randy Segal and Mark Hershman continue to stock Guilds. “They’re unique and iconic guitars that have been around for a long time,” they said. 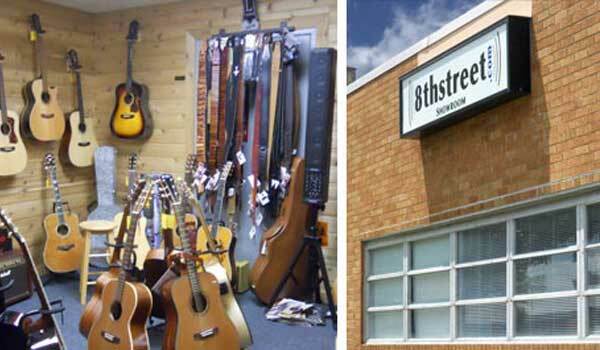 8th Street Music has everything from limited edition models to best-selling Guild guitars such as the GAD series. “They have a particular voicing that people really enjoy when they play them,” Segal noted. And he should know; he’s a seasoned guitarist who has been in the business for more than 30 years. The store serves all types of customers, from beginners to professionals. “I’ve had some customers who are really fine players and have never played Guild, and when they pick one up, they say, ‘Wow! What’s this?’” Segal shared. 8th Street Music has also enjoyed special visits from famous musicians such as Jason Bonham and James Taylor. A U.K. MTV crew also filmed there for reality television show MTV Road to the World Stage.